These flatbreads are the perfect accompaniment to your fresh summer favorites. They pair well with a variety of salads, grilled vegetables, and even meat and vegetable skewers. Just bake directly on the grill, right alongside of the rest of your dinner. It couldn’t be simpler! Combine the water, olive oil, garlic paste, chopped herbs, yeast, and salt in the bowl of a stand mixer. Add 1 ½ cups of flour. Using the beater blade, mix on medium speed for about 2 minutes, until the mixture is smooth. Add the remaining 2 ½ cups of flour and use the dough hook to knead the bread until it is smooth. If it is still sticky, add up to an additional ½ cup of flour and knead until the flour is worked in. The dough should be soft and smooth, but should not be very sticky. Transfer the dough to a lightly greased bowl and cover with a damp towel. Allow the bread to rise until it has almost doubled in size and the imprint of two fingers remains, about 1½ to 2 hours. Punch down the dough and transfer to a floured surface. Cut the dough into 8 equal portions, Shape each portion of dough into a ball, then use your hands to gently stretch it out into an oval (similarly to working with pizza dough). You can stack the flatbreads with a layer of parchment paper between them to make them easier to transport. Preheat the grill to medium-high (450-500°F). 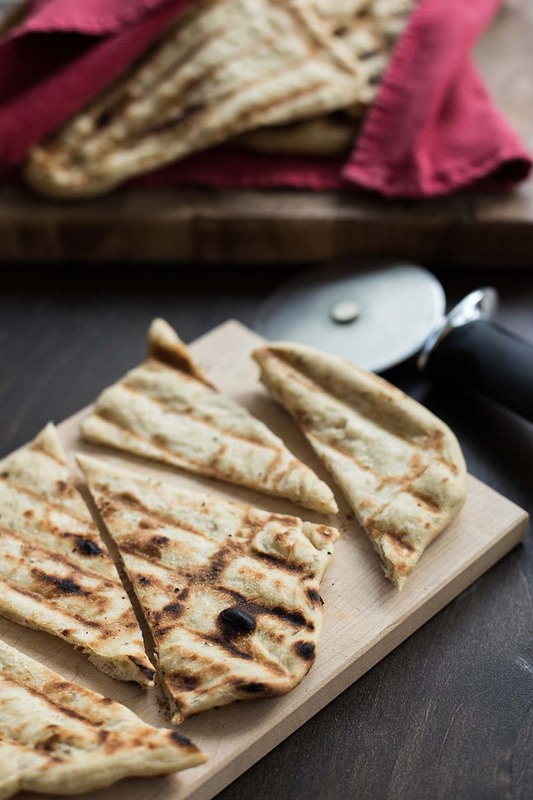 When the grill is ready, lightly brush one flatbread with olive oil. Place the flatbread, oiled side down, on the grill. Cook for 2 minutes, until the flatbread has started to bubble and pulls away easily from the grill. Flip and cook for an additional 1-2 minutes. Transfer to a platter lined with clean kitchen towel. Repeat with the remaining flatbreads. Cut into wedges (if desired), and serve immediately. The flatbreads are best if eaten the same day. However, they can be kept in a sealed container for a day or two. To refresh them, simply warm them in the oven at 300°F for a few minutes. To make roasted garlic paste, simply take 2 heads of roasted garlic and mash it with a fork in a bowl. You should have approximately 2 tablespoons. If you’re in a pinch, you could substitute garlic powder (½ -1 teaspoon, depending on your taste), but it’s not quite the same. Feel free to play around with the flavors. Dried herbs will work, as well, simply use 1-2 teaspoons of dried herbs to replace the 2 tablespoons of fresh herbs in the recipe.